It's a health-wise recipe that's perfect for kids after school, or adults after a workout! Sometimes, a snack can satisfy a child's mounting appetite for 15 minutes, only to leave them hungry an hour later. The key is not just to look at the volume of the snack, but also what it's made of. A snack that fills you up in the moment, but also keeps young minds and tummies humming along for several hours will have the best combination of fiber (for volume), fat (for satisfaction), carbohydrates (for energy), and protein (for muscle building). Count this protein-rich recipe as featuring one of our favorite food combinations: a smooth protein (like Greek yogurt of nut butter) paired with high-fiber fruit. 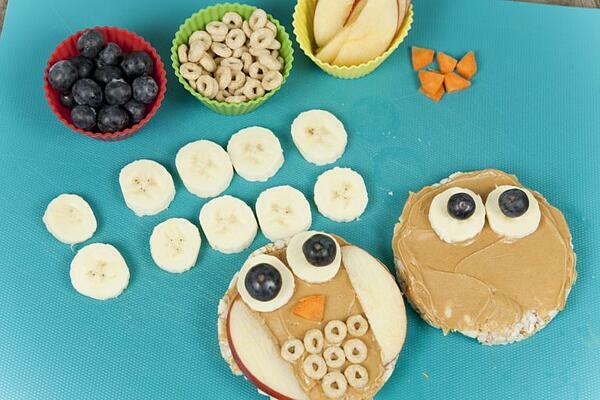 These Owl Snacks are the perfect after-school, poolside, or soccer field sideline snack! 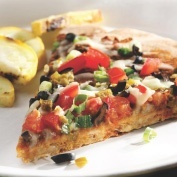 This recipe is perfect for your kids to gain some experience in the kitchen. It's easy enough that they can make if for themselves, or make a batch for the whole family. And clean up is easy! Make enough for your lunch tomorrow or nibble in the car for the ultimate pre-workout snack. 1. Start with your base: a rice cake spread lightly with any smooth protein (almond butter, peanut butter, sunflower seed butter, or any flavor of Greek yogurt. 2. Layer creative slices of apples, banana, blueberries. 3. 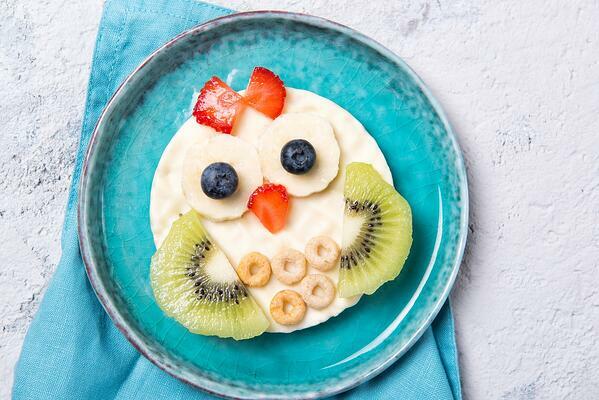 Add patterns or faces using any whole-grain cereals. 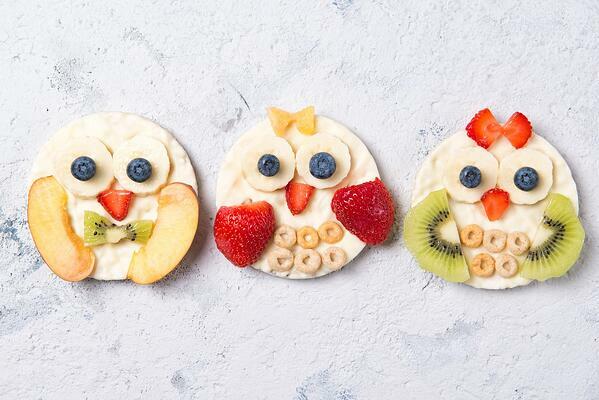 Let the kids arrange the toppings in any way they like. 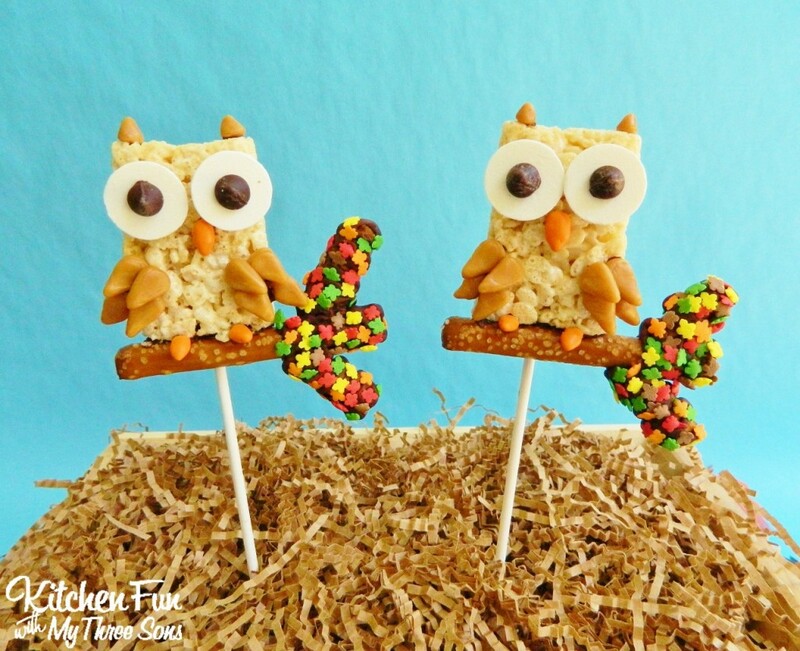 Here's the general idea of how to make your rice crispy treat look more like an owl. But feel free to choose other animals or landscapes too to jumpstart creativity and a love of healthy food. At Cal Fit,we take great pride in our Kidz Klubz and the amazing efforts of our childcare staff. Stop by sometime and say hi, or ask about when our next Healthy Kids activity will be.